A presentation on the relationship between gameplay and game graphics, what you should take into account when creating graphics for games, and how to apply the principles in practice. Contains over 40 slides of compact information, with speaker notes, lots of pretty pictures, and practical examples from real games. Targeted at beginner game artists, but also for anyone interested in games and game design in general. 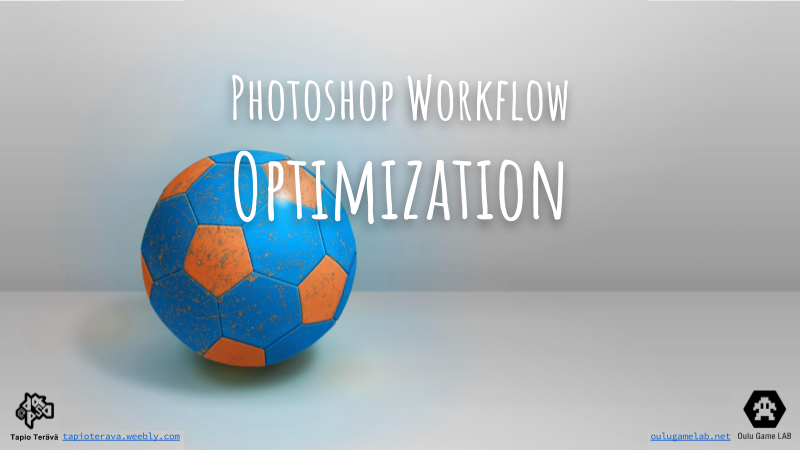 A presentation on how to optimize your workflow in Photoshop - Good practices, overviews of different non-destructive tools and methods, lists of useful keyboard shortcuts, and tips and tricks. Contains over 40 slides of compact information, lots of demonstrative animated gifs, and an example .PSD file with a video breakdown. Targeted at beginner digital artists, but contains useful information for more experienced Photoshop users as well. 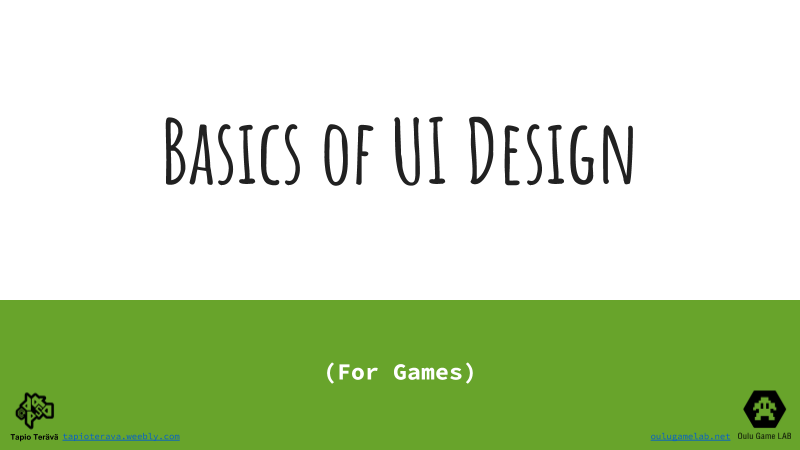 A presentation on the basics of user interface design for games, including examples of different UI types in games, an overview of the general design process, interactive examples, and tips and tricks. 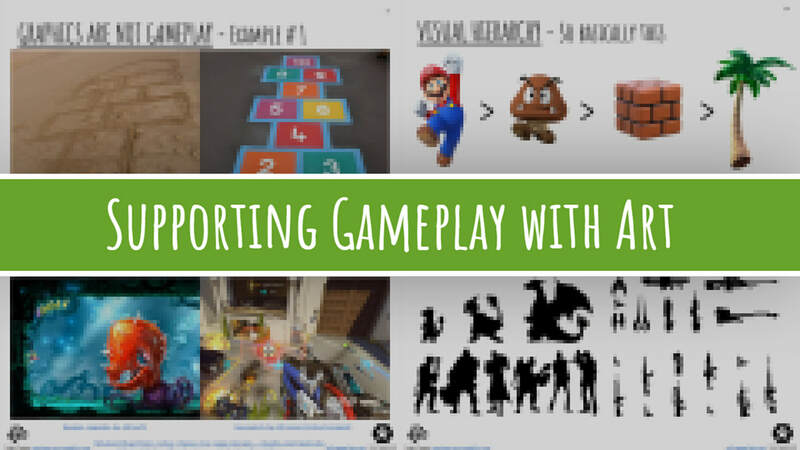 Contains over 100 slides of compact information, practical examples from real games, and lots of pretty pictures and animated gifs. Targeted at beginner game artists, but also for anyone interested in games and UI design in general. A presentation on the basics animation, and how animation can be utilized in games. 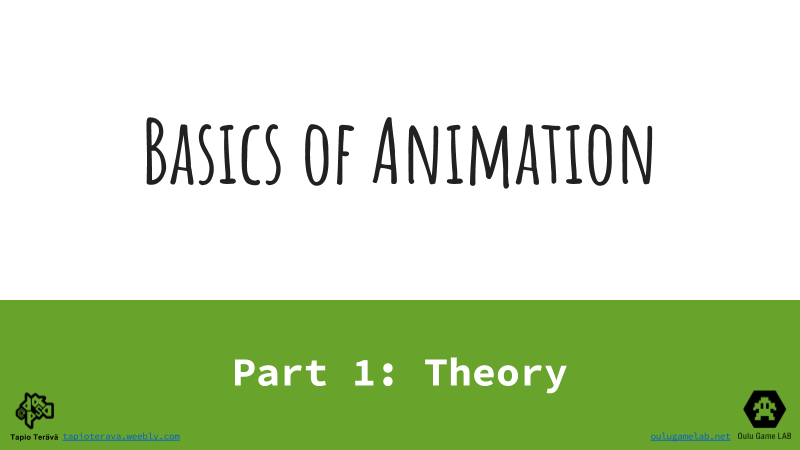 Overview of the basic concepts, and simple explanations of the "12 principles of animation" with visual examples, and how the principles can be applied specifically to animation in games. Contains over 70 slides of compact information and lots of illustrative animated gifs. Targeted at beginner game artists, but also for anyone interested in games and animation in general. 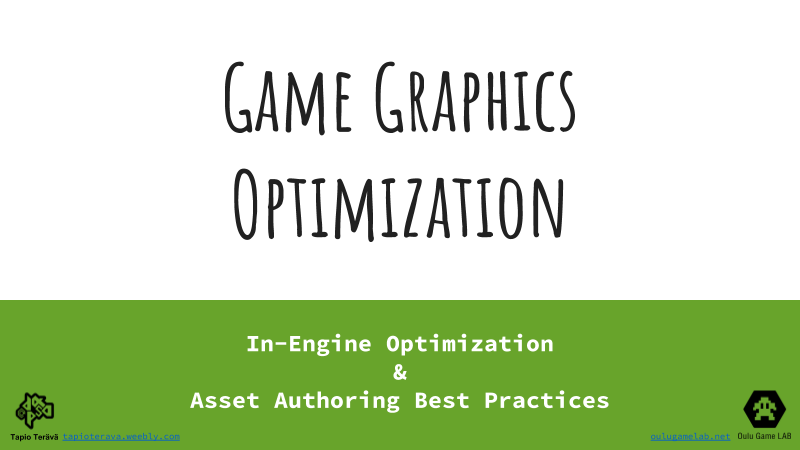 A presentation on what is graphics optimization, why should you care, and how to optimize your game. Presents the biggest performance killers in games, and how to avoid or deal with them using different tools. Tips and tricks for authoring optimized game assets. Contains over 50 slides of compact information and lots of illustrative images and animated gifs. Targeted at both beginner and advanced game artists and programmers, but also for anyone interested in game optimization. 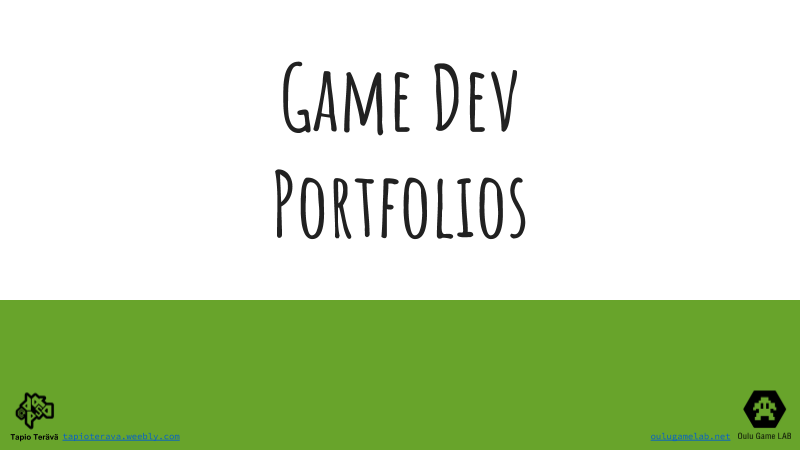 A presentation on what are portfolios in terms of the game industry, why you should have one, and how to create it. Examples of actual portfolios of game designers, producers, programmers, sound designers, and artists. Examples of various tools you can use to create your portfolio. Tips and tricks based on advice from recruiters and industry veterans. Lots of links to further resources. Over 20 slides of compact information. For anyone wishing to get in to the game industry. 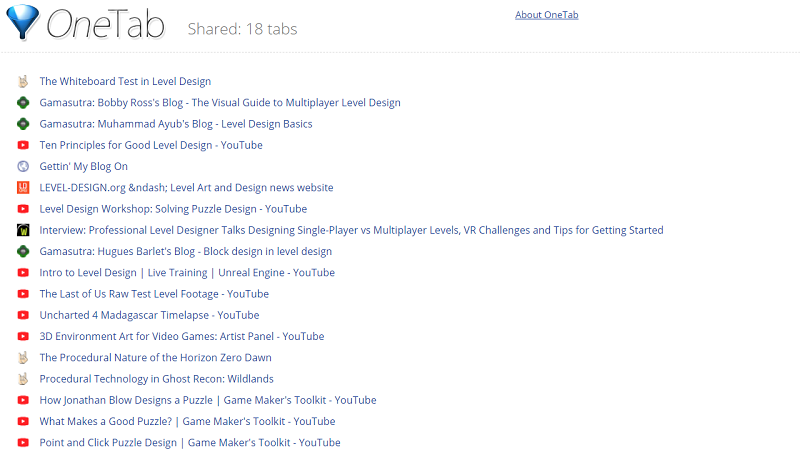 A collection of links to different resources that can be helpful in game development, especially during game jams and similar events. 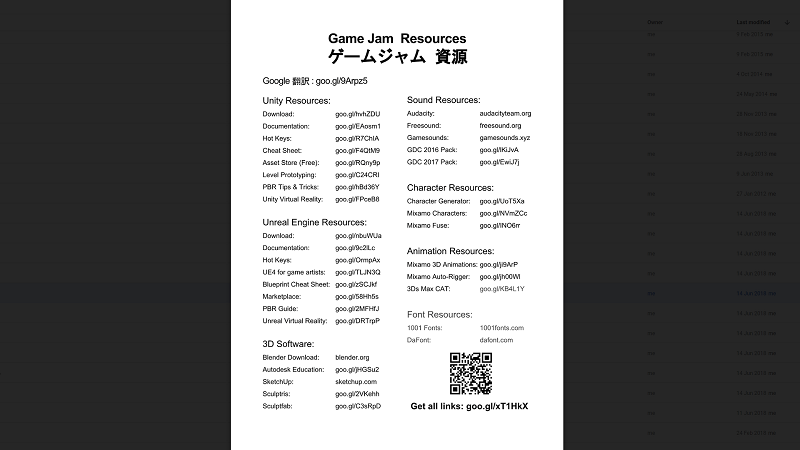 Contains links to download free game development software, assets, sound effects, and fonts, as well as links to game engine documentation pages, tutorials, and guides. 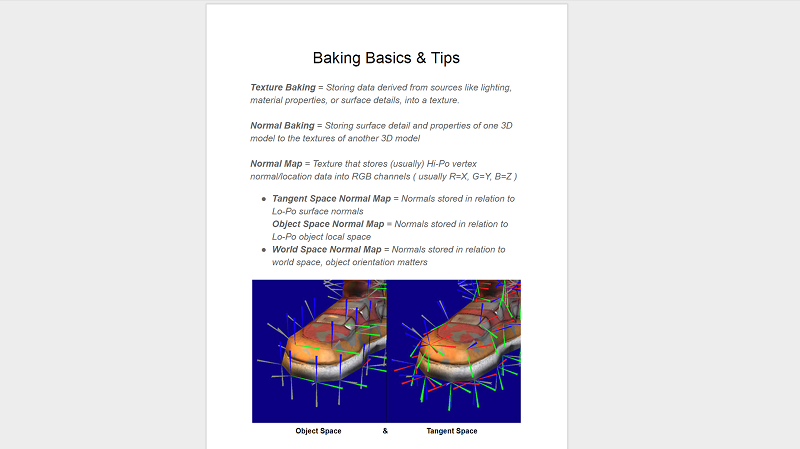 A document that summarizes the different things that need to be considered when baking textures for 3D models. Alternatives to per-object texture baking are presented, and the pros and cons of different workflows and methods are listed. Contains 30 pages of compact information, in the form of bulleted lists, images, and links to further resources. Targeted at both beginner and more advanced 3D artists, who are looking for information on texture baking for games. 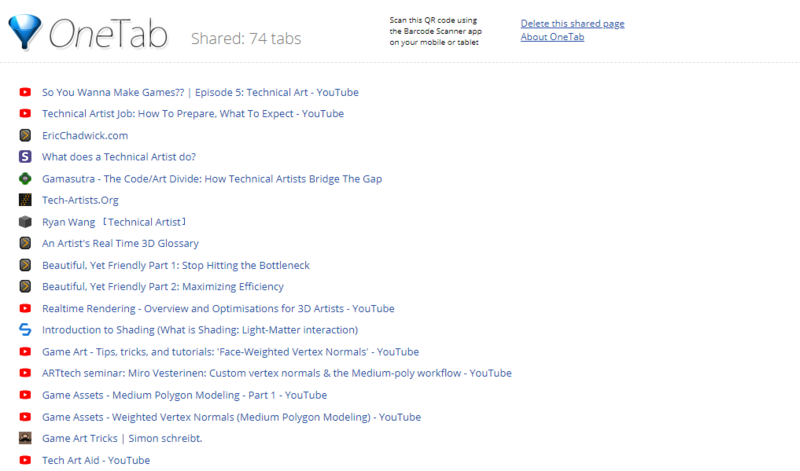 Useful links for learning about technical art. Useful links for learning level and puzzle design. 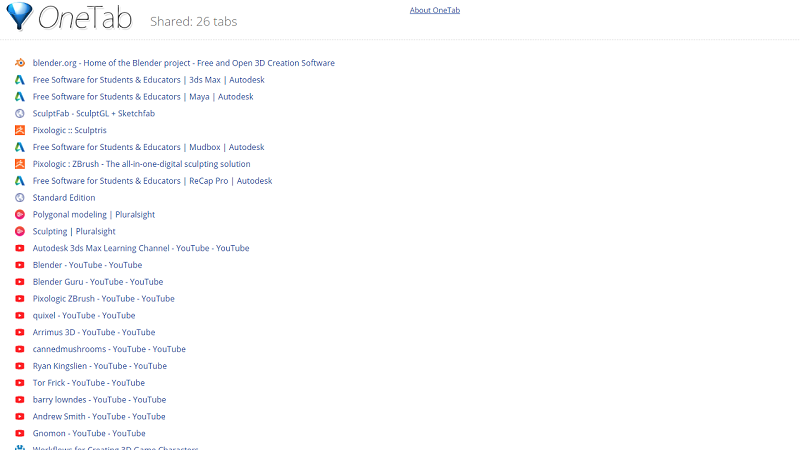 Useful links for learning 3D modeling and sculpting. A compact presentation about my thesis, to provide a quick overview of its contents. A fast way to get an idea before committing to reading the actual thesis. Contains just over 30 slides, with lots of illustrative pictures. Most, but not all of the topics covered in the thesis are shortly introduced using bulleted lists. 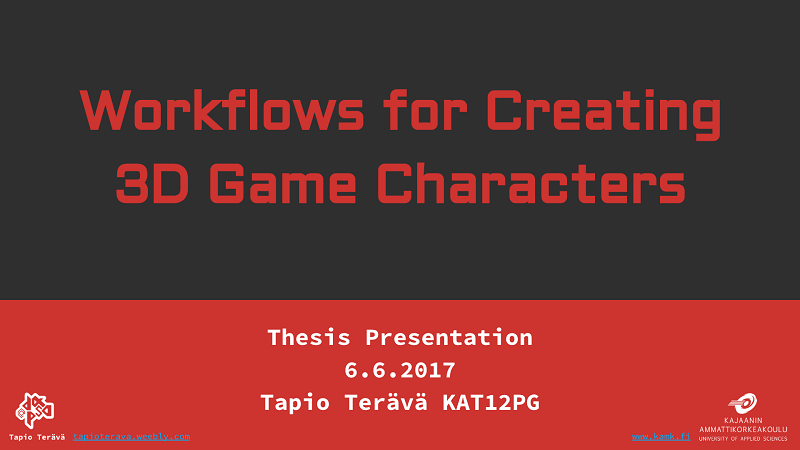 My thesis on 3D game character creation. 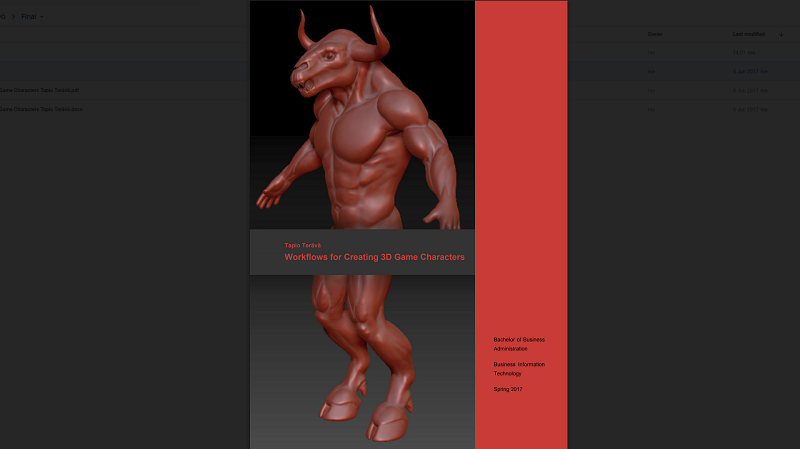 A comprehensive picture of the different workflows used to create 3D game characters, with relatively detailed explanations of the different steps, tools, and techniques. ​Nearly a 100 pages of compact information. Useful for beginner game artists, but also intended to be understandable even for people who are not familiar with game development.